Although you can gauge exercise intensity in many ways -- including the perceived exertion test and monitoring your heart rate -- calculating oxygen consumption is the most precise method available. Your VO2 max is how much oxygen your body uses during maximal effort; your VO2 reserve is a figure that's used as the midpoint in calculations to derive your desired exercise intensity -- in terms of oxygen uptake -- from your VO2 max. 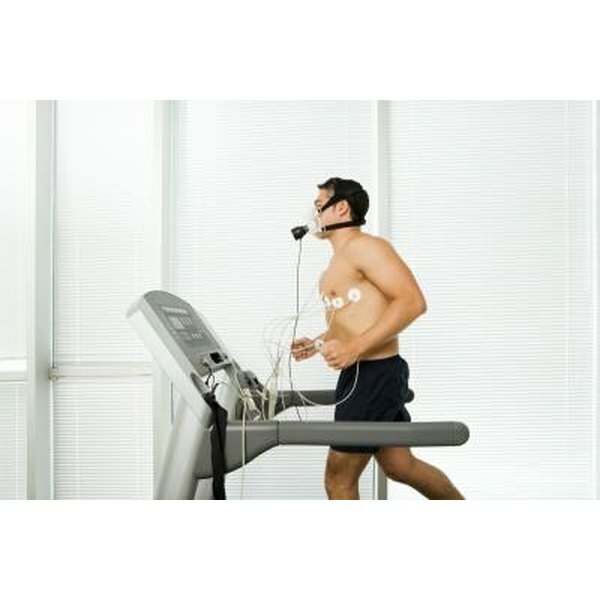 A trainer can estimate your VO2 max with a submaximal exercise test, commonly done on a treadmill. A 2012 study published in the Journal of Strength and Conditioning Research found that the American College of Sports Medicine's protocols for submaximal exercise tests yield a reasonable estimate of VO2 max. If you need a more precise read on your oxygen uptake, however, you can participate in a maximal exercise test under clinical supervision. Once you have your VO2 max, subtract your resting VO2 -- found by multiplying 3.5 by your total weight in kilograms -- from the VO2 max to get your VO2 reserve. The higher your VO2 reserve, the more intense the exercise you're capable of doing. To finish calculating your ideal exercise intensity, multiply your VO2 reserve by your desired exercise intensity. The exercise intensity depends on several factors, including your current level of fitness; sedentary individuals may start with as low as 40 percent of their VO2 reserve, while fit individuals may aim for 80 percent or higher. Journal of Strength and Conditioning Research: Evaluation of the American College of Sports Medicine Submaximal Treadmill Running Test for Predicting VO2max.